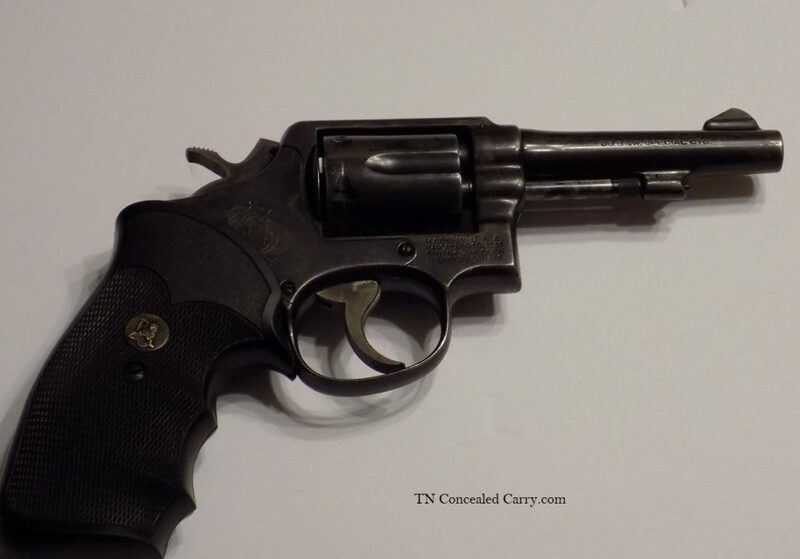 Blog Is The Smith & Wesson Model 10 Good For Concealed Carry? I was recently at a gun show and a dealer friend of mine had a couple of Smith and Wesson Model 10 revolvers. He also had a couple of the Taurus copies of the same gun. Prices were under $300 for each, for even the nicest specimen. All of us, this small group of gun show nuts, commented how they get no respect but they work. That is the beauty of the Model 10. It has been produced since 1899 and is still made today. Simple and reliable are the traits that have allowed it to last so long. The Model 10 started out as the Military and Police and was a variation on the other double-action revolvers made by Smith and Wesson but chambered for the then-new .38 Special cartridge. As time went on, the Model numbers were added in the late 1950’s along with many other features, almost all of them with their own Model number. Fixed or adjustable sights and different calibers like .22 Long Rifle and .357 Magnum added to the variations. A check of the current website has many of these same guns available new from the factory. The Model 10 was not listed (however, the Stainless Steel Model 10 known as the Model 64 was). There have been many small changes in all of the Model 10 family over the years. Most of the changes are incorporated in the “dash.” After the model number stamped in the yoke of the frame where the cylinder swings out, many of these guns will have a dash and number. The closest analogy today is the 2.1 or 3.0 version of a software program. It’s just an updated model with some minor tweaks. Collectors look for certain features and dashes as well. I feel the versatility of the Model 10 is not just in the fact that it is so easy to use and maintain. Many who either aren’t “gun” people or are new to firearms would benefit from a revolver like this one. How many times have you been asked some variation of the “I need something cheap but works” question from a novice gun person? If there is a doubt that they can or will put forth the time and effort to learn a modern service pistol such as a Glock from the ground up, maybe this is a better solution. Back in my gun store days, we did get a lot of “what if there are more than six bad guys after me?” 20 years later, I still believe that at the end of six rounds all parties that are still able will be running away. For that reason, I don’t feel under gunned with a revolver. There really isn’t much available in accessories for these guns. Speedloaders are available for about $9.00 each and I doubt you could wear one out. Contrast that to magazines that start at $20.00 each and you will see the financial advantages start to build. Used leather holsters are cheap and plentiful if you aren’t too picky. A box of shotshells turns it into a decent anti-snake gun. Ammunition is readily available almost everywhere and revolvers aren’t nearly as ammo finicky as semi-automatics. Handling is almost instinctual. The grip angle of these guns allows almost everyone to use their natural point of aim. If you use a set of grips such as the Pachmayr to replace the skinny, checkered wood grips; the modest recoil is even further reduced. The large rear notch sight and big front blade are easy to see even in low light and add to this gun’s shootability. The trigger has improved over time in almost every one of these that I have ever shot. As they wear, they get smoother. The cylinder opens like all other Smith and Wesson revolvers. Push the latch forward and swing the cylinder out to the left. Then, the extractor star can be actuated to remove empty casings and ready the cylinder for reloading. Load with either a speedloader or six individual rounds and close the cylinder. The cylinder revolves counter-clockwise. Like other double-action revolvers, the hammer can be cocked to fire in single-action mode or a long trigger pull can fire it double action. The only maintenance issues that I have ever seen are minor. Sometimes the extractor rod can start to unscrew and bind the gun up so that the cylinder cannot be opened. Carefully screwing the left hand threaded rod back just a little with fingers or a pair of needle nosed pliers will usually allow it to swing open. Just put a little Loctite on the ejector rod threads and you will probably never have the problem again. Some folks will loosen the set screw on the front of the grip. It holds the mainspring in the grip frame, loosening it makes the trigger pull lighter and very crisp. That also reduces the amount of force that the hammer has when it falls, leading to light primer strikes that don’t set off the ammunition, especially reloads. Not recommended! I highly recommend all of the Model 10 family of revolvers. The K frame, as Smith and Wesson calls it, denotes their medium size revolver and is or was available in just about every configuration you can think of. I also encourage someone looking for a Model 10 to be open to its brother models. With a bit of looking, you might find a deal on an adjustable sighted Model 15 or a .357 Magnum Model 13 for just a few dollars more. I’ve seen both as police trade-ins in assorted conditions. No matter which one you end up with, they are hard to beat.